Two news items surfaced Tuesday, April 21, that offer contrasting world views of Israel’s Occupation of East Jerusalem, the West Bank and Gaza. Item number one is from the daily news report issued by the International Middle East Media Center (IMEMC). Item number two is an alert from End the Occupation informing readers that Maryland Democratic Senator Ben Cardin has introduced an anti-BDS amendment to a pending bill in the Senate Finance Committee. If passed, this amendment would make it a “principal trade negotiating objective of the United States” to “discourage politically motivated actions” that “limit commercial relations” with Israel and Israeli businesses, including those operating in Occupied Palestinian Territory. In less formal senatorial language, what Senator Cardin offers is an anti-BDS (Boycott Divestment, Sanctions) amendment designed to protect the modern state of Israel from a non-violent tactic to expose and hopefully reduce the daily atrocities of Israel’s occupation. In recent years BDS has grown in worldwide influence. Any action aimed at Israel’s occupation of Palestine alarms AIPAC. When AIPAC is alarmed, Liberal and Conservative Zionist senators of both political parties, receive their marching orders. Senator Cardin, the new ranking member of the Senate Foreign Relations Committee, is the senator pushing this anti-BDS amendment. He was elevated to his post after the resignation of the previous Democratic ranking member, New Jersey’s Sen. Robert Menendez, an ardent Zionist, who voluntarily stepped down as ranking member Wednesday, April 15. His resignation was prompted by his indictment on federal charges of bribery and conspiracy. Menendez pledges to fight the allegations. He remains a member of the committee and the senate. Neither of these stories, one from IMEMC, and the other from End the Occupation, is expected to receive much exposure in mainstream U.S. media outlets. Both items however, carry long range consequences and offer a moral challenge to the consciences of the American public. Item number one from IMEMC reports that on Tuesday, April 21, at dawn, Israeli soldiers invaded a number of villages and towns in the southern West Bank district of Hebron. The soldiers searched homes, and kidnapped three Palestinians. Three other Palestinians were given military orders for future interrogation. Soldiers also kidnapped one Palestinian in Bethlehem. It is a familiar story, repeated daily in various locations throughout Palestine. It is a story that represents nothing less than an ongoing Israeli strategy to intimidate and subdue the Palestinian people. The exact text of the amendment has not been released, but it is assumed to be similar to a bill—S.619, the United States-Israel Trade Enhancement Act of 2015—Senator Cardin introduced last month. The pro-Israel forces in the U.S. have apparently spread their anti-BDS campaign into state legislatures. For example, the Illinois House and Senate could vote by Friday ​on ​Illinois bills, ​HB4011 and SB1761. These two​ bills​ are designed to “prohibit state agencies and state retirement services from entering into contracts or investing in companies that choose to boycott Israeli businesses because of Israeli human rights violation​s”. In his April 17 Guardian article, author Teju Cole distinguishes two forms of violence employed by Israel to control the people and land of Palestine: Hot violence and cold violence. As Teju Cole explains, hot violence is openly visible. Some hot violence takes place in the daily deaths and kidnappings of Palestinian citizens. Some hot violence is also seen in the destruction of Palestinian homes by the IDF. Cold violence is different from overt killing and military invasions. Cold violence takes its time until it finally gets “its way”. In his Guardian article, published in England, but not in the U.S., Cole describes the cold violence he found in Sheikh Jarrah, a predominantly Arab and old, East Jerusalem neighborhood. “Children going to school and coming home are exposed to it. Fathers and mothers listen to politicians on television calling for their extermination. Grandmothers have no expectation that even their aged bodies are safe: any young man may lay a hand on them with no consequence. The police could arrive at night and drag a family out into the street. For more than 50 years, western Christians have known about the occupation. 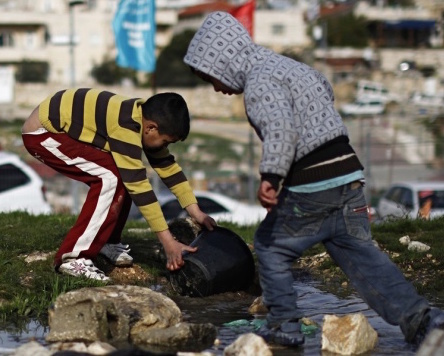 What they choose to ignore are the cold and hot violence Israel employs with impunity. Or, like the good Germans who avoided noticing the smoke from Nazi extermination centers, those men and women asleep in their beds tonight will one day cry, “we did not know”. They do know, but good Germans, and good Americans, learn to lie when confronted with painful truth. In +972, an Israeli-based progressive blog, Palestinian Yael Marom writes about young Palestinians who are doing something about their lives under oppression in Gaza. “Life in Gaza has always been hard. But after Israel’s last attack it became impossible to live here. The problems became worse and the conditions deteriorated to the point that it is no longer possible to live humanely — and nobody cares,” Sajida Alhaj, 21, says in a Skype interview. Alhaj is part of a group of young activists in Gaza that last month published a call for a mass protest in the Strip on April 29, demanding an end to the siege, the occupation and the human and civil rights abuses that accompany them. The activists are calling on anyone who believes in freedom, justice and equality, the world over, to join them and organize parallel protests in their own countries, to express solidarity and to recognize their suffering. Gimbel’s book describes Albert Einstein’s “deep involvement with the Zionist movement, promoting the settlement of Jews in Palestine”. What led Einstein to embrace the settlement movement? “Einstein saw these settlements as a benefit both to Jews and to Arabs, giving Jews a place to live and prosper, and giving Arabs a chance to share the blessings of progress and prosperity. In 1929, when some Palestinian Arabs organized a violent opposition to Jewish settlement and killed some Jews, the British colonial government suppressed the rebellion and enforced a peaceful coexistence of Jews and Arabs. But Einstein understood that this enforced coexistence could not last”. “The first and most important necessity is the creation of a modus vivendi with the Arab people. Friction is perhaps inevitable, but its evil consequences must be overcome by organized cooperation, so that the inflammable material may not be piled up to the point of danger. Sixty years after Einstein’s death, the hot and cold violence which sustains the Palestinian Occupation continues to be the violent tactic-of-choice for the state of Israel, which entered the region not to find “contact in every-day life”, but to conquer the indigenous population. Einstein was wrong about the settlements. This brilliant and caring man did not anticipate the governments Israelis would choose to lead them. 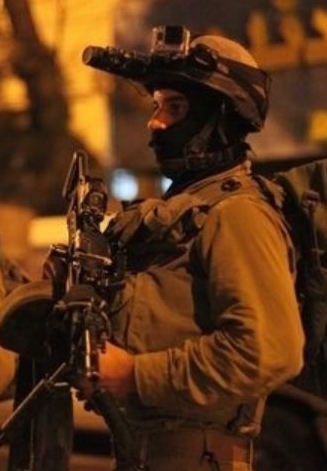 The photograph of an IDF soldier involved in a nighttime incursion into the Hebron district, is from alfajertv.com.